When the iPhone 5 launched on T-Mobile April 5th for pre-orders and launched April 12th in stores T-Mobile called the first week sales “gangbusting.” Of course that left plenty of room for interpretation about how the company defined “gangbusting” and whether they met any internal goals. 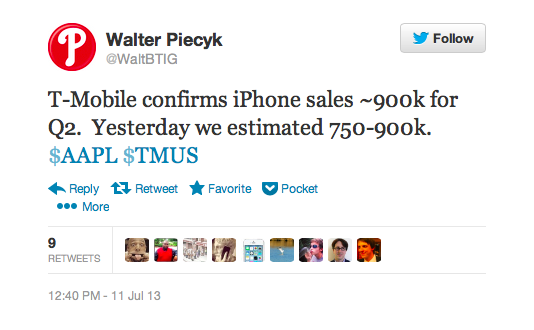 Well, the exact sales figure has come to light via a Tweet by Walter Piecyk, a wireless analyst at BTIG. “T-Mobile confirms iPhone sales ~900k for Q2. Yesterday we estimated 750-900k,” he tweeted out. T-Mobile CEO John Legere did mention that iPhone sales accounted for 39% of April smartphone sales and 29% of May sales. “May was better than April, and April was most of our ‘iPhone blip,’” Legere told AllThingsD yesterday. T-Mobile will make its quarterly earnings official on August 8th at 11:00AM Eastern and I suspect iPhone sales will account for a good deal of conversation. T-Mobile’s true iPhone sales test will come with the next-gen launch and how many customers T-Mobile can pull from other carriers when the device launches simultaneously on all carriers. With the unveiling of JUMP!, it’s also likely that some of T-Mobile’s current customer base will take advantage of this new offer to get an existing device now and then take advantage of their early upgrade in January. This is great news, I like the iPhone 5. But I wonder how many galaxy s4s they sold??? A lot more than the Iphone 5, because of the percentage sold of Iphones and almost the entire rest of the sales probably went to Android. There’d be a small percentage of Windows and Blackberry phones sold but again, small percentage. Doubtful. Remember, the S4 didn’t debut until May essentially. If the iPhone accounted for over 30% of sales in April & May, the S4 would have had to have done a much bigger percentage in May to sell more than the iPhone over the entire quarter. No way 75%+ of phone buyers in Q2 bought either an S4 or an iPhone. T-Mobile does have a ton of other phones for sale. Also, keep in mind that the numbers Legere mentioned include all three iterations of the iPhone being sold. They stated the Iphone sold 39% and 29% of the smartphones with T-mobile, the first two months of being sold. It would have to be Android for the rest, not necessarily the S4 just Android. Windows and Blackberry make a very small percentage in overall sales. I never even brought up the S4, only Android. You didn’t have to. He asked how many S4s were sold. You replied, “a lot more than the iPhone 5.” One would readily assume that that is what you were referring to. True, but since Samsung had a 95% market share of Android in Q1, One could extrapolate that the Samsung S4 could have doubled the numbers of the Iphone in the second month, plus the Q2 includes June. I do say could have and I’d be very confident in the S4 selling more phones in the quarter than the Iphone. The Iphone had a huge splash with 39% but the numbers tumbled quickly, because everyone that wanted an Iphone for so long most likely bought it in the first two months. T-mobile’s always had Android, so it wouldn’t make that much of a difference. Did you forget about the HTC One? I’d imagine it’s doing pretty well, also. Incorrect. Samsung has never had a 95% market share in any quarter. Think about what you’re saying. That would mean they sold 19 of 20 of all Android devices. That would be insane. Not even close. They made 95% of the profits. Their market share was less than 50%. So, I stand by my statement. Sorry, it’s 95% of money made from Android. But they still did dominate the market with over 30% of all smartphones sold, while Apple was at 18%. Yeah. I already knew that. Wow !!! thats a-lot of iphones in just 1 Quarter. T-Mobile is on track to beat Sprint next quarter in iphones sold. Cant wait until August 8th :-) Good News is ahead. They would sell alot more i5’s if they would sell them at $99 down like they did when they first released them. I wish T-mobile would confirm the removal and swift dismantling of their EDGE network. They won’t. They are the LAST nation carrier to still have an M2M network. And over time they can increase the costs, to be slightly less than what ATT will charge for their 3G network. Excellent news for Apple Inc, so how many new subscriber got added? I love this blog, but it takes a lot of logical gymnastics to claim that some third-party analyst’s sales estimations are confirmation from T-Mobile itself. 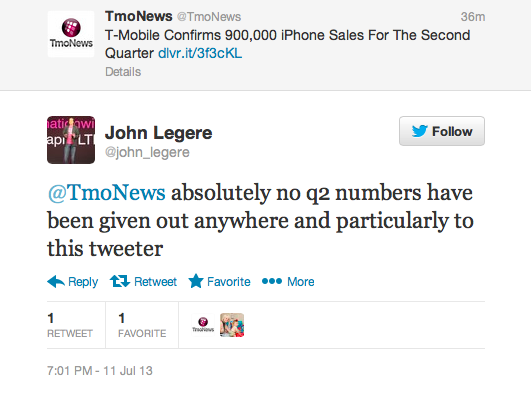 I hope he’s correct, but until TMO provides the numbers, TMO has confirmed absolutely nothing. Hence the update…and also the analyst claimed the numbers came directly from T-Mobile itself, not just his own sales estimations. David – love your blog. Keep it up. I’m deeply suspicious of analyst opinions and objectivity. For the most part, analysts and ratings agencies are kept/owned by banks and investment houses, who need their investment portfolios in good condition to make money. It’s too easy to for corporate ownership to order an analyst to give a positive outlook to keep a stock price high/increasing. That behavior was rampant with Enron…it’s too bad many quickly forget. And it’s a huge conflict of interest. Applied to this scenario, does Walter Piecyk play any role in managing (in whole or in part) any fund containing Apple and/or TMO stock? Because it is easy to see how this tweet could be designed to pump up both companies’ stocks. That I can’t say, but Legere refuted my articles Tweet as you can see via the image added as an update to the pic. So he may not have given a comment, but someone clearly gave Walter reason to believe that number was legitimate. Whether or not it is seems like something we’ll get clarified with their first quarter earnings call. I see your point though and I agree, and it may just be something that was provided off the record and not meant for publication. Off the cuff remark or something.